A seismometer is a device that transforms the seismic energy of the earth into an electrical signal. This particular version measures the amount of translational motion the earth has undergone. 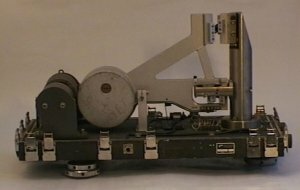 Generally, for an overall picture of each movement one would use this in conjunction with vertical and deformation measuring seismometers. The 10kg suspension arm, mounted on the flexure pivots at one end of the instrument, forms the horizontal pendulum. This oscillates around a sub-vertical axis with a natural period adjustable between 10 to 30 seconds. For the calibration required at each particular natural frequency there are calibration coils located with the main coils. The base of the instrument transmits the earth's motion through to the assembly of magnets. The main coils are attached to the end of the suspension arm and are placed between the poles of a pair of strong cup magnets. Pendulum motion induces an electric current in the coils, proportional to the velocity of this relative motion. This induced current also causes electromagnetic damping in the seismometer. A lamp, aperture, photoresistors and resistors form the Mass Position Monitor, for an electrical indication of the inertial mass position whenever required. A Remote Centering Accessory is also supplied. At the far end of the instrument there is a small scale with a pin to show deflections. A small circular level on the top of the instrument is used to ensure the equipment is entirely horizontal. The instrument also contains a heater to stabilise conditions and minimise noise. Additionally there is a cover that, when secured, ensures the seismometer is watertight and durable enough to work in unfavourable conditions. McGraw-Hill, Encyclopedia of Science & Technology, McGraw-Hill Inc., USA, 1992.